That's a lot of faces all in once, but last week has been a bit hectic for me, so I didn't get any blogposts done. I did finish some of the video's I was working on, about the Midori style travelers notebooks I made recently. I'll post those at the end, just in case you would like to see them. First though, as this is a 29 faces post, I did do a face a day this week and I am keeping up. Here are they all in chronological order. Somehow I didn't feel like painting this week. I did journal a lot though, just to keep a clear head. And with my journalling I still wanted to make a face a day. So I snuck them in between the writing. Got inspired by DaVinci, prompted by Piarom from Mix it Monthly. And doodled some of his ladies. I think I need to explore this doodling with pen a bit more, because I like it, but I find it very difficult to shade anything. So those are my #14-20 faces for the 29 faces in 30 days challenge. I really like his ladies and they are so much fun to draw, so today I finally got the urge to paint something and felt I wanted to make something for the Mix it Montly challenge for september: Feathers from DaVinci. So I got out my altered book journal and took the two ladies #16 and 17 and tried to paint them, making it #21 and 22. The colors to use were mint green, grey and hibiskus... and a feather. I completely forgot about the feather, but I'll call them "birds of a feather" so that's that taken care of then =). I love this image of the two ladies and think I may play around with them some more to see what I can do with them. I must confess, I like the lady on the left best. She seems lighter and more fragile than the lady on the right. I feel she has a more protective role. and the first of the 3 tutorials on how to make them. I also got some great news today when I found out that my Book of Books with the secret belgian binding was featured at Simon Says Stamp Monday challenges (Embossed). I hope I made up a little for being AWOL for the past week and I wish you all a wonderful weekend. Fantastic Faces!! They're all so good. Your painted journal page is just gorgeous!! Wonderful sketches and amazing journal! Wonderful faces!! There are a few angelic looks here!! Knap hoor, om ondanks alle drukte toch de gezichten te maken...en met heel mooi resultaat! Beautiful faces and a wonderful post! Thank you for sharing! Oh!!! Your faces are simply wonderful! You have such a great style Monique! what a fantastic style Monique! I love all your faces! Fantastic Faces,Monicue, i loved all,so beautiful. Beautiful faces! I don't know how you do it. I have a hard time finding time to do one face a month. Your work is truly amazing! Your use of line in the face sketches is brilliant, and the painting in the later pieces is superb. Blessings! 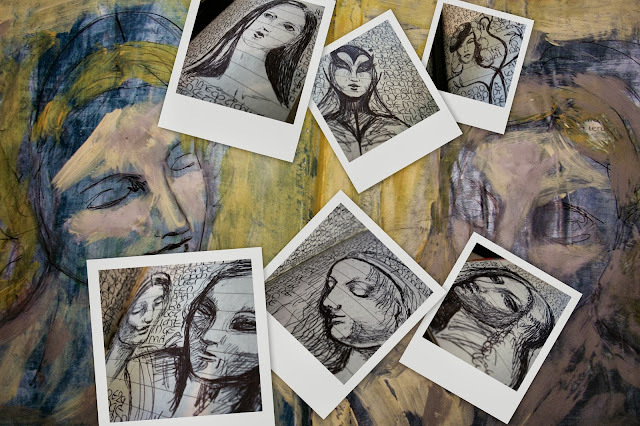 Astounding work on the dimensional faces, Monique - really beautiful in the sketches, and stunning as they move into painted existence. I'm doing my best to do some overdue catching up, so will have to come back for the videos another time (I know, I'm storing up a back catalogue of stuff to come back for!). Hope you're having a wonderful Sunday. Oh Monique, these are fantastic. I'm in awe. These are simply incredible and so dimensional. Yep, I'm late, but I've been offline most of the week, so I had to stop by tonight. Your drawn faces are so varied and I love your painted ones too with all the texture. I'm now going to watch your videos which I always enjoy and find very interesting. really gorgeous art, sketching and painting-wow! And congrats on being featured at Simon Says! Great work Monique!! Ive been so busy too am only managing to blog catchup now, sorry for delay in commenting! I like the expressiveness you have created with the two faces! Golly! These drawings are fabulous and this photo layout is so attractive. Wonderful sketches and painted art journal pages too!